Mark your calendar to attend an upcoming MPA Information Session. Meet the faculty, learn about the admission process and requirements, and see where this program might lead you. RSVP to mpa@csustan.edu to save your seat now! The MPA program was recently awarded 6-year NASPAA Accreditation through August 31, 2024. As the only NASPAA-Accredited MPA program in the northern San Joaquin Valley region, Stan State strives to uphold the rigorous expectations and commitment to quality public service education expected by NASPAA standards. For more information on NASPAA accreditation and standards, please visit www.naspaa.org. A master's degree in Public Administration (MPA) from California State University, Stanislaus offers you far more than a professional degree. Our program is tightly connected to the surrounding Northern San Joaquin Valley. The Central Valley is our laboratory for public administration theory and practice. An MPA degree from Stan State means you will be equipped to make a difference in your community; it means you will be given the tools to create positive social change in the Central Valley. 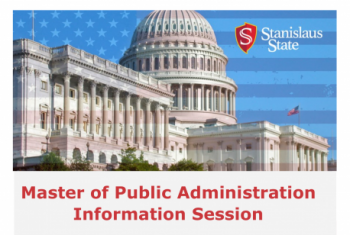 Established in 1973, the Master of Public Administration program at Stanislaus State offers a well-regarded and well-established professional graduate-level course of study designed to prepare our students for the challenges and opportunities of a career in public service, non-profit entities, or for-profit firms that have close ties with the public sector. The MPA Program provides education and training of public administrators and policy analysts for leadership and management careers at the local, state, and national levels - with particular emphasis on government and non-profit organizations in the Central Valley. With around 60 students each year, the program covers public service-oriented management science and the political, ethical, and organizational challenges in the public sector of the 21st century. 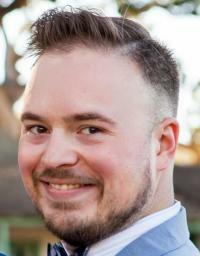 "It has been a life-changing and most beneficial experience. I have learned so much and I apply the theories and principles every day in my work. I'm excited about the opportunities that will open up to me with this degree. I especially appreciate all the time, energy, and wisdom poured into me from the great MPA faculty." We offer evening classes at both our Turlock and Stockton campuses, and about 25% of our courses are either partially or fully online. Program faculty and the comprehensive MPA curriculum provide students the foundational knowledge, practical skills, administrative capacities, and intellectual tools necessary for effective public management and the successful fulfillment of their professional duties and responsibilities. The MPA at Stanislaus is nationally accredited by the National Association of Schools of Public Affairs and Administration (NASPAA) and the program has served for many of our graduates as a successful launching point for careers in both government service and non-profits as well as providing opportunities for those already working in the public sector to expand and further hone their administrative skills, assisting them in advancing within and beyond their current organizations. 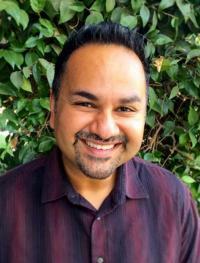 Stan State's MPA program is led by two co-directors, Dr. Umar Ghuman and Dr. Gerard Wellman. Dr. Ghuman is in charge of the program's accreditation review, internships, and community networking, while Dr. Wellman handles admissions, advising, and student support. You can reach both co-directors by e-mail or just call (209) 667-3388. To provide education and skill acquisition for public service professionals with particular emphasis on the needs of government and not-for-profit organizations in Northern and Central California. To maintain and improve the capacity of local and regional governments to provide excellence in public service. To conduct research that will broaden the base of knowledge and skills in the field of public administration. To serve the regional community through faculty and student involvement in public affairs. Students have sound and appropriately comprehensive knowledge of the problem-context and environment of public administration. Students have sound and appropriately comprehensive knowledge of organizational decision-making processes. Students have appropriate personal competencies in problem analysis and decision-making.